Apple Watch continues to be the world's most popular smartwatch by a significant margin, according to analysts. IDC estimates Apple Watch shipments totaled eight million units worldwide last quarter, which also makes it the best selling wearable device during that period. The research firm says one in every five wearables shipped last quarter was an Apple Watch, on the strength of new Series 3 models launched in September. By comparison, Fitbit reported sales of 5.4 million wearables last quarter, while Xiaomi shipped 4.9 million units over that time, according to IDC. An estimated 41 percent of smartwatch shipments came from smaller vendors grouped into an Others category. The wearables market includes several inexpensive fitness trackers from the likes of Fitbit and Xiaomi, while the Apple Watch starts at $249 for Series 1 models, so it's really an apples to oranges comparison. For that reason, MacRumors also reached out to IDC for data specific to smartwatches, which it defines as wearables that can run third-party apps natively. The data shows that Apple Watch accounted for an estimated 61 percent of worldwide smartwatch shipments last quarter, with no single competitor coming anywhere close. Samsung's market share was just 8.4 percent, according to IDC, despite the quarter encompassing the lucrative holiday shopping season. 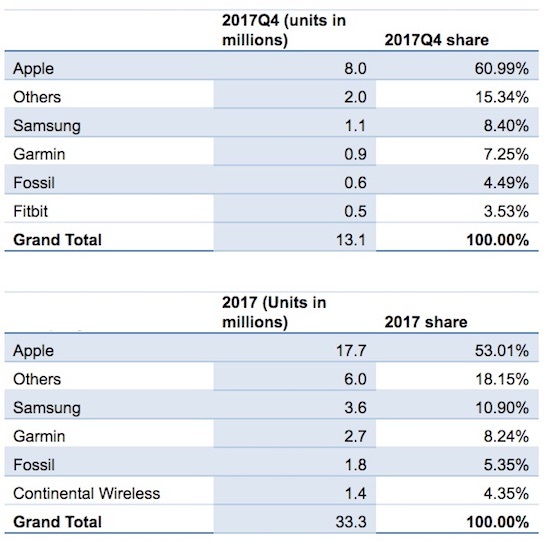 For perspective, the estimated 17.7 million Apple Watches shipped in 2017 was more than all competing smartwatches combined last year. Samsung, Garmin, Fossil, Chinese kids smartwatch maker Continental Wireless, and other vendors shipped an estimated 15.6 million smartwatches cumulatively last year. 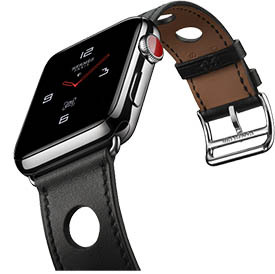 "Consumer preferences have shifted to more sophisticated devices and towards well recognized brands," like the Apple Watch, said Jitesh Ubrani, senior research analyst at IDC. "It's due to this that the wearables market has seen healthy double-digit growth in average selling prices since 2016." Apple doesn't break out Apple Watch sales like it does with iPhones, iPads, and Macs. Instead, it groups the wearable under its "Other Products" category, alongside Apple TVs, AirPods, Beats, iPods, accessories, and soon HomePods. On an earnings call last month, Apple CEO Tim Cook said the Apple Watch had its best quarter ever during the fourth quarter of 2017, with over 50 percent growth in revenue and units sold for the fourth quarter in a row, and strong double-digit growth in every geographic segment that Apple tracks. Apple analysts, who closely examine Apple's earnings reports and other clues to estimate Apple Watch sales, have similar totals as IDC. Ben Bajarin of Creative Strategies estimates Apple Watch shipments totaled 17.4 million last year, while Horace Dediu of Asymco comes in at 17.7 million. Apple Watch shipments outpaced all Swiss watch brands combined for the first time last quarter, according to IDC's Francisco Jeronimo.‏ In other words, Apple is now the biggest watchmaker in the world. Others said the same about the Airpods being a gimmick to, and look at the success of both of these products. The Apple Watch can only get better from here with health related advancements like glucose monitoring. This is just the start of what is to come for the Apple Watch future. It does so many things well already, but the health aspect of Apple Watch is a staple. Apple has no competition when it comes to smartwatches and tablets. Not true. As an outdoors enthusiast, the Garmin Fenix watches are much better. Can you elaborate why the Fenix is better? You telling another forum member “Not true” doesn’t explain your reasoning. Yes, it's a slick watch, but, I do like my Samsung Frontier Gear S3 better. I owned two iterations of the A-Watch, and have found the Gear to be more intuitive and useful for my purposes. And I think it looks a lot better for me. Still the, A-Watch is nice and I look forward to watching as the two brands make things even better. Well my Series 0 that Ive taken excellent care of barely functions now. Software or hardware it doesn’t matter Im not impressed.